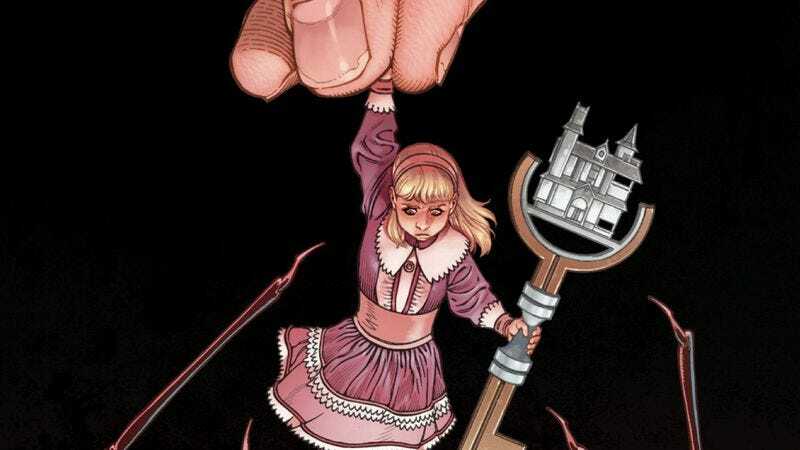 Joe Hill and Gabriel Rodriguez’s Locke & Key is one of the greatest horror comics ever made, and while the series ended three years ago, the creative team is returning to Keyhouse Manor with the new Small World one-shot, offering a glimpse into the history of the book’s magical keys and their past users. Set at the beginning of the 20th century, Small World follows two sisters who are gifted a magical dollhouse replica of their home, allowing them to spy on other inhabitants and manipulate reality in frightening ways. A pencil eraser through a wall becomes a giant bludgeon in reality, and a booger deposited through the window becomes a steaming mound of green slime. Hill has a talent for coming up with keys that are simultaneously fun and menacing, and it’s quickly evident that Mary and Jean will be ignoring the dollhouse’s intended purpose of teaching young girls about domesticity. This is the ultimate toy that has actual ramifications on the real world, and Mary immediately considers the opportunities for blackmail while Jean just wants to play. Hill makes great use of dialogue to highlight the age difference between the sisters, and little touches like Jean knowing the perfect grammar for the phrase, “But dad said it was for both of us,” indicates that sharing is a common issue for these two siblings. Gabriel Rodriguez grew dramatically over the course of Locke & Key, and that artistic evolution continued after the series ended. These Small World preview pages are filled with detail that immerses the reader in the time period and setting, and he does exceptional work playing with the dramatic changes in scale introduced by the Small World Key. Colorist Jay Fotos amplifies the texture in Rodriguez’s meticulous linework with his rendering (check out that oozing booger slime), and he reinforces the flashback nature of this story with a subdued, slightly faded palette. Locke & Key fans can make their way back to Keyhouse Manor when Small World hits comic shops and Comixology on Wednesday, but this is also a great entryway for anyone curious about this acclaimed series.